Most of them like to have Vegetable puff, I too comes under that list. But I could not get my favorite puff in my surroundings. Four years ago, one fine day my husband told about pastry sheets. We immediately went to our regular grocery store for getting ready made pastry sheets. We bought it and tried this recipe very next day. It came out well. I was flying and no words to express my happiness. From that day, I always keep this pastry sheets handy. It is a very simple and grand starter for parties. I kept this yummy snack as a starter in my home parties. I thought of sharing this recipe for the past one year but could not. But it is up today for Love2bake event. I would like to participate in the Love2bake event which falls on every monday. It is a weekly event which is started recently by our co-blogger Sangeetha from Spicy treats. You could make these sheets into either or as your desired pinwheel shapes. It is totally upto your wish. First boil carrot, potato and beans with salt separately. I used microwave for boiling. (It must be cooked but not mashy consistency) Keep it aside. Heat oil in a pan, once it gets heated, add cinnamon, then add onions. Fry until the color of the onion turns transparent. Add ginger garlic paste and fry until the raw smell goes. Add bell pepper, fry for less than a minute. Add garam masala and red chilli powder, mix well and add little water immediately. Add boiled vegetables into the fried mixture and keep it in the flame until the water completely goes dry. Veggie mixture is ready to keep inside the pastry sheets. Please remove the cinnamon stick before using this veggie mixture. 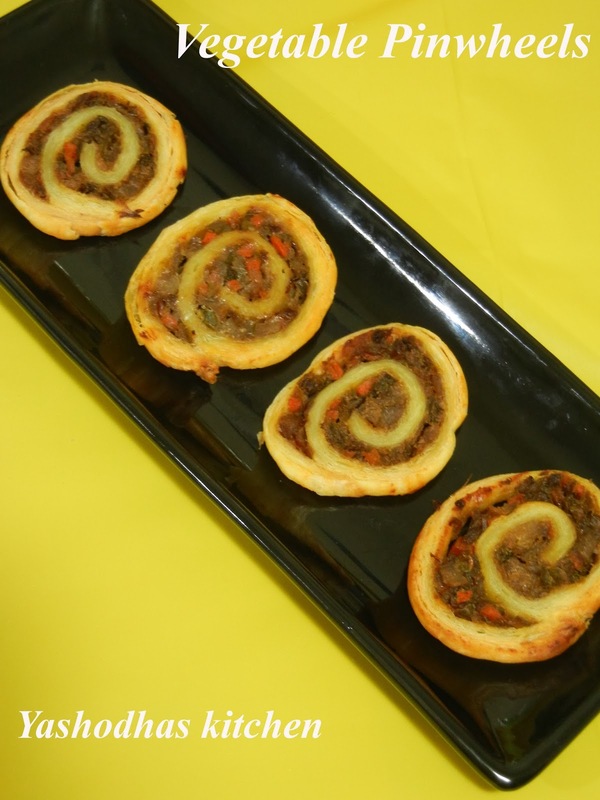 How to make Pinwheels using pastry sheets? First you must thaw the pastry sheet for 40 minutes by remove it from the freezer to room temperature. If you want to thaw both the sheets, keep the box at the room temperature else take one sheet and wrap the unused sheet and place it back to the freezer. You could also thaw it for overnight by transfer the sheets from freezer to refrigerator. Heat oven to 400 degrees F. Grease the baking sheets or line with parchment paper. Unfold the pastry sheet in the lightly floured surface. Brush it with milk mixture. Spread the veggie mixture on the sheet. While spreading veggie mixture please leave 1/4" space around its sides. Start rolling from one side until the pastry sheet ends. Seal the sheets at its end. Brush it up with milk on the outer surface too. Cut into 1/2" slices. Place the cut- pieces on the baking sheets and brush it up with milk mixture. Bake them for 15 minutes or until it get golden color. Please keep it in the oven to get warm before serving. Please don't thaw the unused pastry sheets. Don't forget to seal the edges of the pastry sheet while finishing your scroll. 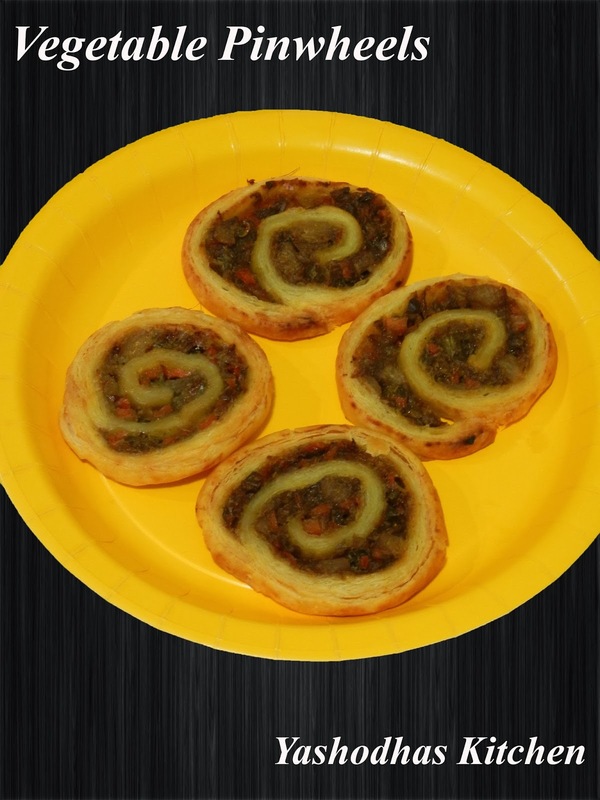 very interesting vegetable pinwheels :) looks very tempting ! !